Two years ago, Kaiama L. Glover [who recently published the official translation from French to English of ‘Hadriana dans tous mes rêves’] reached out to me when she found out about my work. 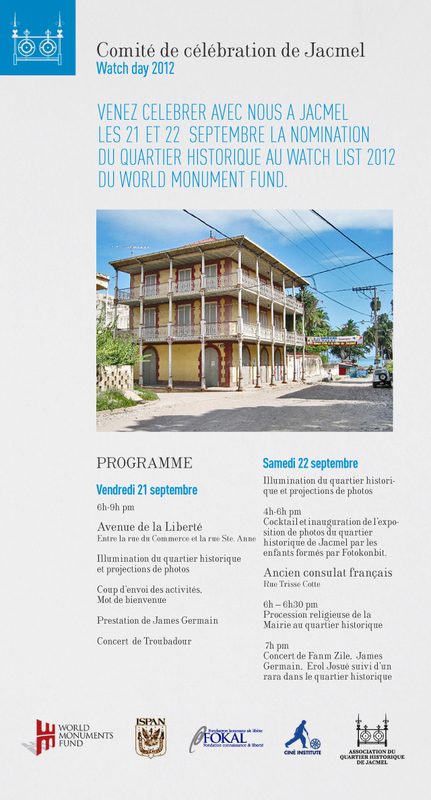 We are now, along with the historian Laurent Dubois and a couple of great women artists from Haiti, Tessa Mars and Mafalda Mondestin, planning on the first tier of a longer project on cultural preservation and architectural preservation in Jacmel. We convened at Duke University earlier this month for a kick-off meeting. Laurent Dubois is a current professor at the institution, Tessa Mars was then undergoing a residency as a visiting artist, Glover flew in from Paris where she is currently working on the archives of René Depestre and myself I was also really happy to join from New York where I am currently based. We made the distance and it was truly worth it. “Hadriana dans tous mes rêves”, first published in 1988, was recently translated from French to English by Kaiama L. Glover. For the AIAS chapter at RISD, a series of blogposts exposed students’ experience visiting interesting architecture sites or working in different architecture offices. In the post below, a friend described her experience visiting Zumthor’s pavilion. Looking back at the post, I realize that i might have been subconsciously inspired by the simple, mysterious and dark allure of this project- which I remember liking upon reading her entry. When approaching this year Serpentine Pavillion by Swiss Architect Peter Zumthor, I could not help but compare its modest appearance to last year’s luminous red social hub, designed by Jean Nouvel. Zumthor’s black box in comparison is more somber and mysterious, and gently invites people to venture inside. Four entryways on opposing sides of the pavilion allow visitors into a dark slender enclosed corridor, with another four openings to a garden within. A rectangular bed of grasses and flowers designed by Piet Oudolf sits at the center of the inner space, mirrored directly above by an opening to the sky. The roof’s moderate pitch that ends at this open slit allows light to pour into the structure. As I sat with other visitors to the pavilion, lining the edge of this courtyard, I felt like this stretched space with darks walls, and single opening to the sky, made us all very hypersensitive to the nature within. Interestingly, I felt as if the structure allowed me to appreciate nature far more than I had when I was completely surrounded by it in Hyde Park moments earlier.